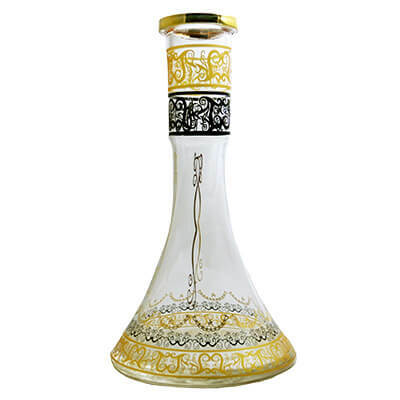 The Vapor Hookahs Bohemian Style King Glass Hookah Vase is ideal for replacing a damaged vase or for providing an alternate vase to enhance the appeal of your Hookah. Vapor Hookahs Glass Hookah Vases are elegantly designed to add style and sophistication to any setup at an affordable price. The King Vase is a trumpet style design with an elongated neck. 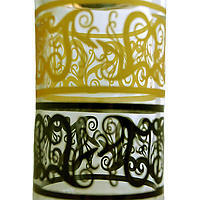 The glass is adorned with black and gold accents that go around the tip and base with vertical curvilinear lines that further accentuate the tapering design of the glass. Vapor Hookahs Glass Vases are guaranteed to fit most Medium and Large Style Hookahs.